Presbyopia is the gradual reduction in the amount that the eye can change its focus. This reduction is a result of the continued changing of the biological lens inside the eye, and is a normal part of ageing. Patients with presbyopia will have more trouble reading and may get eyestrain and blur for near tasks. Our optometrists in Adelaide City and Woodville have multiple options at their disposal for hyperopia management. Book an appointment or contact us to find out more. Presbyopia usually becomes noticeable between the ages of 40 and 50 as an inability to focus on near objects. People in this age group often find that they have to hold things further away to see them clearly. Presbyopia can be corrected by an optical prescription specifically designed for close work. This can be provided in many forms, including reading glasses, bifocals, trifocals and progressive lenses (multifocals). Contact lenses and orthokeratology can also be used to correct presbyopia. Presbyopia is a common condition that makes vision difficult at a normal reading distance. It is not a disease, but rather a refractive issue. How will presbyopia affect my vision? Close tasks such as reading and sewing become difficult, particularly in poor light. For example, you may find that you are holding your newspaper further away from your eyes to make the print clearer. Presbyopia does not affect distance vision. You may also have difficulty concentrating when reading or you may find periods of close work result in sore eyes, headaches or tiredness. It is important to understand how your eyes change their focus for viewing close objects. Normally they are focused for distance vision. Inside the eye there is a lens about the size of a pea. To focus on close objects, a special muscle in the eye changes the shape of the lens. This process is called accommodation. The lens loses its flexibility with age and is less able to change its shape. This is a completely normal change, just like stiffening joints or greying hair. The loss in lens flexibility is the reason that close focusing becomes more difficult. Interestingly, the muscle that changes the shape of the lens when it is flexible continues to function normally until old age. Who is likely to become presbyopic? Everyone experiences the ageing process that causes presbyopia. The condition cannot be prevented. Does presbyopia come on quickly? No. Presbyopia is usually first noticed around the age of 40 to 45 years. Although difficulties with close work may seem to come on suddenly, the ageing process that causes presbyopia is gradual and has been ongoing since childhood. Between the ages of 45 and 65, the amount of presbyopia increases, making near work more difficult. From 65 years onwards, there are unlikely to be any further significant changes to vision due to presbyopia. Presbyopia is corrected by a prescription designed especially for close distances, in the form of spectacles or contact lenses. It is important that the prescription is calculated for the distance at which you do your close tasks. It is not possible to treat presbyopia by surgery unless the surgeon deliberately makes one eye shortsighted for reading. Through discussion with your optometrist, you will be able to decide on the best way of preparing your prescription. 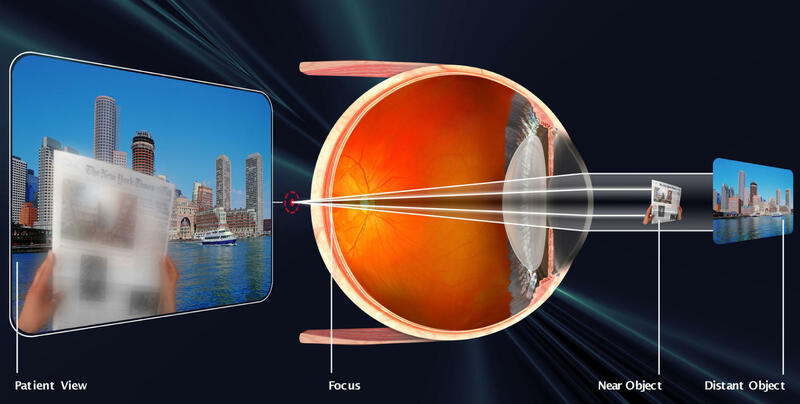 The correction for presbyopia will make near objects clear but distant objects blurry. This means that if you have a pair of spectacles just for reading, you will not be able to watch television while wearing them. Having different prescriptions for distance and reading can be a nuisance, especially if you have to change spectacles all the time. One way around the problem is the use of bifocals. These are specific lenses that have a prescription for distance vision in the top half of the lens and a prescription for near vision (reading) in the lower half. Another form of spectacles used to correct presbyopia is ‘look-overs’ (half-glasses). Other options include the use of trifocals, progressive lenses and some more complex contact lens prescriptions. Does presbyopia mean that my eyes are deteriorating? No. Although your close-focusing system is not functioning as well as it used to, once presbyopia has been corrected with spectacles you will be able to see close things as well as you always did. Presbyopia does not represent a threat to your eye health. When should I have my prescription for presbyopia renewed? Between the ages of 45 and 65 years, your prescription is likely to change significantly. It is sensible to have your eyes examined every two years to review your correction and your general eye health. If you experience vision problems within two years of your previous examination, you should make a review appointment with your optometrist. Your optometrist will advise you of the most appropriate period between consultations. Will wearing spectacles weaken my eyes? No. Presbyopia will continue regardless of whether spectacles are worn. Wearing spectacles will not accelerate or slow the development of presbyopia. Some patients notice their vision is worse for reading once they have removed their near glasses. This is generally because the relative difference in clarity is more obvious once spectacles start to be worn.